Chinese equities are back in focus as the US and China close in on a trade deal. We believe that simply moving into a general, broad-based China or emerging market fund may not be the most optimal approach. Broad-based China or emerging market indexes often have greater weights to sectors such as financials and commodities while underweighting growth sectors, such as consumer technology. Despite the recent expansion of technology and e-commerce in emerging markets, the largest sector by weight of the top 5 US-listed emerging market ETFs is financials with a median weight of 25%. Discerning investors may consider adding KWEB to their current China or emerging market allocation in order to achieve the optimal sector exposure to match their specific risk/growth appetite. Chinese retail web sales totaled US$1.14 trillion in 2017 (over twice as much as the United States), and online shopping accounted for 19.6% of all retail purchases. Despite the massive size of China’s online retail market, it still has room to grow, with an internet penetration rate of only 57.7% as opposed to 88.5% in the United States. 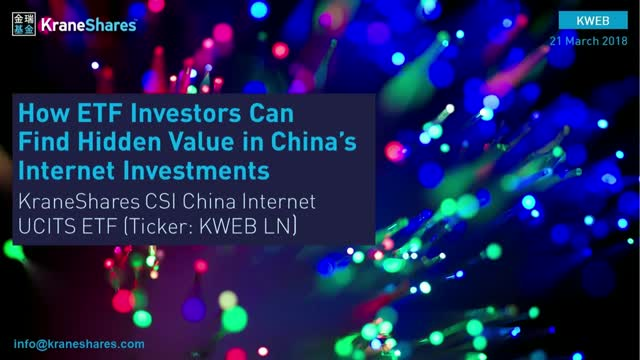 KraneShares Chief Investment Officer, Brendan Ahern, provides an introduction to the growing China Internet sector and the KraneShares CSI China Internet UCITS ETF (ticker: KWEB), now available on the London Stock Exchange. Krane Funds Advisors, LLC is the investment manager for KraneShares ETFs. Our suite of China-focused ETFs provides investors with solutions to capture China’s importance as an essential element of a well-designed investment portfolio. We strive to provide innovative, first to market strategies that have been developed based on our strong partnerships and our deep knowledge of investing. We help investors stay up to date on global market trends and aim to provide meaningful diversification. Krane Funds Advisors, LLC is majority owned by China International Capital Corporation (CICC).